How to inspect your roof for storm or hail damage. When it comes to the roof, a heavy storm can leave homeowners scratching their heads as to whether or not they’ve incurred damage. The following are a few easy methods to determine if parts of your roof have gone rogue or remained pristine. And you don’t necessarily have to climb a ladder to do it; sometimes a pair of binoculars and a pair of sharp eyes work best. 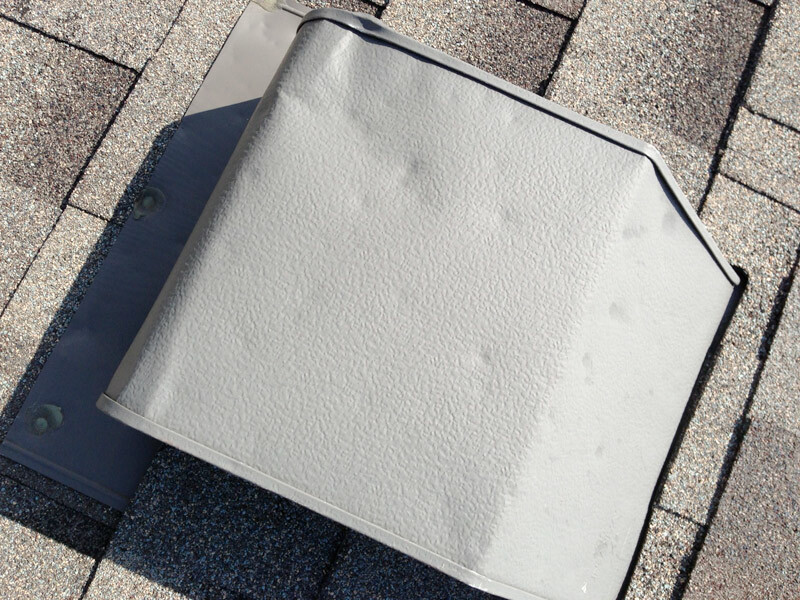 Spotting dents in your vents is a great indicator that your roof has taken some hail damage. 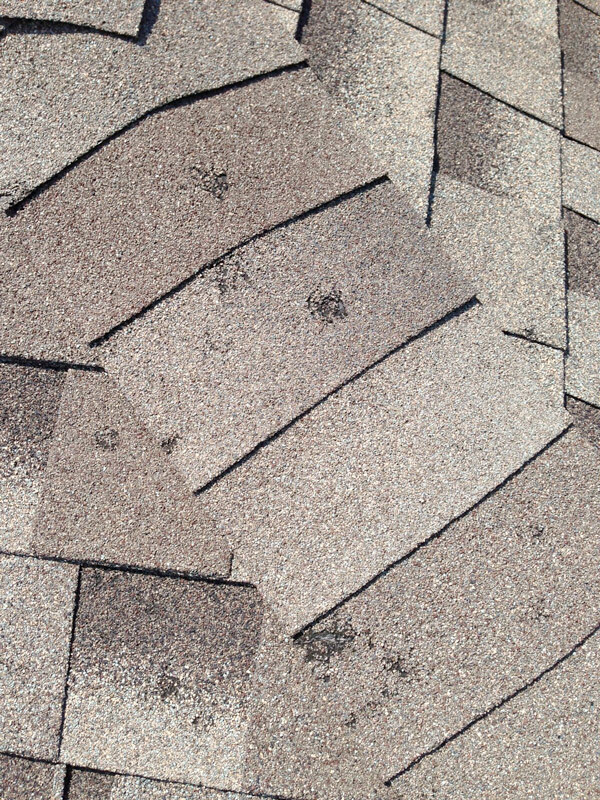 The black marks on these shingles indicate areas where damage has occurred. A professional roofing company will mark and count the number of damaged areas. Insurance companies will use a professional assessment to see how much damage has occurred to the entire roof. 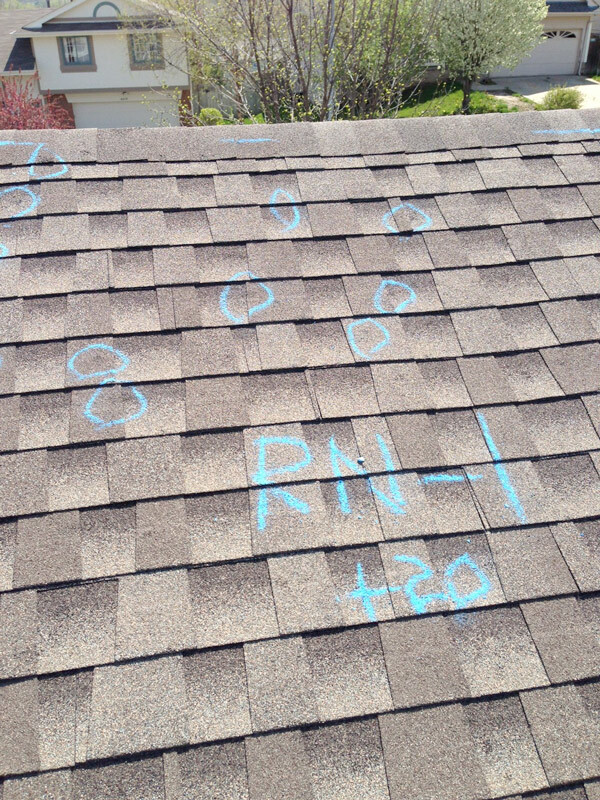 A good contractor will climb up on the roof and identify spots where damage has occurred by outlining damage with chalk. Look for missing or creased shingles. Although these signs are not always obvious and usually require a professional inspection, whenever a gap or unsightly groove in your shingles is in plain view, it’s a telltale sign that it might be time for a new roof. Look for granules that have been washed or forced off your roof. These granules normally protect the asphalt layer under your shingles from UV damage, and losing them not only indicates damage, but also speeds the aging of your roof. You’ll spot them in your driveway or your gutters if there’s been damage. Check if other parts of your home, yard, or car have hail or storm damage. If they do, your roof most likely needs replacement. The roof has a vast amount of surface area and often receives the heftiest brunt of a storm. Think of any adjacent storm damage on your property as “symptoms” that can diagnose the wellness of your roof. Look at your own neighborhood. If your neighbors are having their roof replaced, or roofing contractors are suddenly visiting your neighborhood, there’s a good chance you’ve sustained damage. While these are a few simple DIY tips that could save you time and possibly alleviate some concerns, you can always call the experts at Total Construction Services for a free assessment and the most capable, experienced craftsmen giving your roof the utmost scrutiny. Serving Omaha, Papillion, La Vista and surrounding areas since 1987. With the potential for hail storms to roll through greater Omaha, your roof is in constant danger of bombardment. Thinking that your roof suffered damage in a storm and calling for an inspection isn’t always enough to warrant an insurance claim. Many insurance companies look at a variety of factors when determining if insurance will cover damage. 1. How wide spread was the hail damage? Damage to a singular roof in your Omaha neighborhood or area might raise a red flag for insurance companies. If a number of residents from a particular area all file claims, insurance companies are more likely to approve the claim for your property. It is important to speak with neighbors in your vicinity, if you think you have any hail damage to your Omaha roofing. 2. Negligence is cause for denial. Just about all insurance policies imply that it is the homeowners responsibility to provide routine maintenance. If your Omaha roofing was in need of repair prior to a storm, an insurance company can deny your claim based on the lack of care. Often times insurance companies do not want to pay for the cost of an entire new roof, so showing that you provide routine maintenance (fixing leaks, address damage as it occurs) can increase your standing with your insurance company. 3. Have a certified 3rd party look at your roof! At Total Construction Services, we have HAAG certified inspectors who are trained to examine and estimate the amount of damage and the work required to fix your Omaha roofing. We work directly with insurance adjusters, providing inspection services and estimates upon request of insurance providers. Is your roof system in poor health? We all rely on our roofing system to keep our homes dry and direct rain and snow safely away. All of us wish our roofs can last forever, however we all must realize that all roofs degrade over time. With the often-intense weather we see in Omaha, weaknesses in your Omaha home’s roofing system may begin to show. After a heavy rain storm here are a few items to keep an eye on. Are your shingles loosing ‘pebbles’? The granules that adhere to asphalt shingles break down over time, eventually losing their sticking power, and can wash off in rain. Check near the end of your downspouts for little stone looking pieces. These little granules can often be seen in the sediment in your gutters. 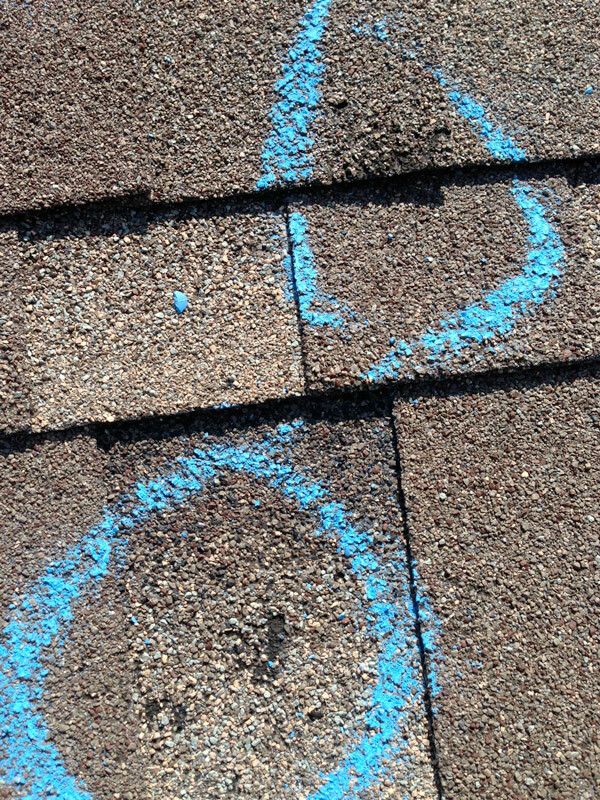 If you see more than a handful of granules, it may be time to have your roof inspected. Just about all homeowners know they need to be better at cleaning their gutters. Your gutters should not be overflowing in a heavy rain. If they are, your gutters need to be inspected. Get up on a ladder and see if you have debris stuck, or if your gutters are pulling off the fascia. There should never be a gap between the edge of your roof and your gutters. Any gaps or overflow have the potential to damage your siding, or cause water to sit too close to your home. Check your basement for signs of water! When your gutters are working properly, you should never see signs of water in your basement. If the water is not being move away from your house, you should check to make sure your downspouts are attached properly. Water next to your foundation can cause a ton of problems, including the growth of mold. Total Construction Services has HAAG certified inspectors in Omaha who are able come out and help diagnose any issues with your roofing. We also are mold remediation specialists, ready to treat and prevent mold problems in your home. When it comes to top-of-the-line roofs, Total Construction Services Omaha roofing contractors install the best. Since 2001, DaVinci has produced award-winning polymer roofing products designed to match the look of slate or wood shingles. Their custom state-of-the-art polymer technology is designed for both its durability and its looks, creating beautiful and durable composite roofing tiles. 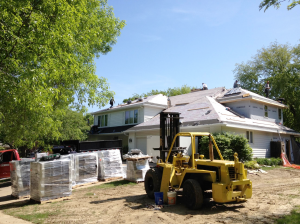 As part of a recent home renovation project, Total Construction Services Omaha roofing contractors installed DaVinci tiles to complete the homeowners’ vision. Total Construction Services on the scene of a recent remodel and roofing project. To learn more about DaVinci tiles, contact Omaha’s roofing experts – Total Construction Services. Shake shingles may be the sharpest looking roofs out there. The classic lines instantly give your home an impressive look. Many Omaha homeowners look to cedar shakes to give that extra dash of class. These shakes often come with some drawbacks. Replacement cost for raw materials has increased in recent years, leaving many insurance policies on shaky ground. As your cedar shakes break down over time, you should keep in mind potential replacement materials. These shakes have the closest look to the wood shingles. Made from polymer reinforced with fiber and resins, these shingles have heighten resistance to cracking and thermal shock. Made from 95% recycled and reclaimed materials, these shingles are resistant to discoloration, and are made from natural fibers to replicate the look of real wood. They are also resistant to mold, mildew and insects. Plastic is a polymer that has no fiber reinforcement. Many varieties of these products exist, and are made to duplicate different looking roof options. Use of plastic roofing has been on the rise, most likely due to lower product costs. Plastic roofing shingles are lightweight, and easy to install. While the costs may be reduced, the look of this shingles often leaves homeowners wanting more. Although top of the line clay shingles have minimal water absorption and high resistance to thermal shock and cracking, their inability to withstand freeze-thaw makes them an illogical choice for geographies where cold weather conditions are prevalent. The benefit to clay tiles, is that if properly maintained, they can last a lifetime. Made from recycled materials, rubber offers a sustainable way to keep your home safe. Rubber resists cracking, discoloration, mold, and withstand harsher climates. These shingles generally take a bit of maintenance and can be problematic in windy situations. With all the options out there, your best option might be to call the roofing experts at Total Construction Services. Our professionals can explain all the options, and help you decide on the best look for your roof. Total Construction Services of Omaha is proud to share with the industry our latest accomplishment. Kevin Jackson and Mitch Stringer recently attended a three day educational and accreditation seminar held in Las Vegas, where both received their HAAG Commercial Roof Inspector Certification. 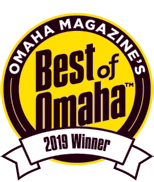 This level of recognition puts Total Construction Services into a class of Roof Damage Assessment inspectors in Omaha, that only a select number of professionals in the US can claim. At Total Construction Services, we believe that education, training, and certification set us apart in the Omaha Roofing industry. Let us help you on your next project. The economy is in better shape and confidence is returning. This can be seen in neighborhoods nationwide, and especially in Omaha, where more dumpsters are visible in front of homes as remodels are on the upswing once again. So yes, it’s a fantastic time to think about that sensational Omaha home remodel you’ve been dreaming about, including new roofing—as long as you think safety first. Lead and asbestos and mold, oh my. There are numerous sources of lead in our environment. It doesn’t decompose or rot, so it stays in place for a long time. The major source of lead is from lead contaminated dust—most of which comes from old paint. It can also exist on walls, woodwork, siding, doors, windows and lead plumbing pipes. This poses a more serious risk for children than adults—a risk that you’ll eliminate when you choose the right Omaha residential remodeler who knows how to completely eradicate traces of lead or dust. It’s always better to be safe than sorry. Assume that your home, if it’s older, contains asbestos in the walls and insulation. The only way to be perfectly certain, however, is to have it analyzed by specialists. The right Omaha remodeling team will bring this necessary skill to the job to keep you protected from hazards. Moisture and housing materials, when combined, often create mold. This can become airborne and pose a respiratory threat. But again, in 2015, the right professionals are equipped to handle this in its entirety. In the hands of top remodeling professionals, the results for your home will not only be outstanding, but more importantly, thorough. A good remodel goes beneath the surface and does the job correctly, right down to your Omaha home’s underlying infrastructure. When remodeled by experts, you can rest assured that every square foot of your home, including roofing, will look spectacular—and be even safer than it was before the remodel. And that’s a win-win for any homeowner. Whether you’re looking for top technicians or roofing experts for the job—or your seeking a career in this rewarding field at an award-winning company—contact the experts at Omaha’s Total Construction today. Considering a remodel? Know this before you begin. Without a doubt, home remodeling is an exciting time. In fact, it’s so exciting for many homeowners that they’ll start a project too quickly without doing their research. Remember, before snagging the first available Omaha remodeling and roofing crew and diving into those great ideas—tempting as that might be—it’s important that you to shop around and choose the best Omaha contractor that’s right for you. Make sure any Omaha roofing and remodeling candidate you’re researching has these crucial forms of protection for you, the customer, before starting any job. This will ensure that you’re working with a reputable professional while providing some recourse if something goes wrong. And speaking of insurance, ask your provider for a list of preferred Omaha contractors they often work with. On top of making sure a potential Omaha contractor has an active license in Nebraska, look for additional signs of quality. Do they carry IICRC certification? If roofing work is involved, are they HAAG certified? You can also check if they’ve been awarded by local Omaha business groups such as the Better Business Bureau. Look for customer testimonials about the company. Do they receive positive reviews? What do third parties like Angie’s List have to say? Additionally, you may ask to be introduced to the lead person who may be working on your home and assess their experience for yourself. Remember, this is your home. Be as selective as you like when choosing your Omaha contractor. When it comes to finding the right Omaha home remodeling and roofing professionals, choose them as carefully as you’d select a new furniture set. You won’t regret the results. For all of your remodeling or Omaha roofing needs or questions—as well as career inquiries within this rewarding field that demands top technicians more than ever—contact the experts at Total Construction today.